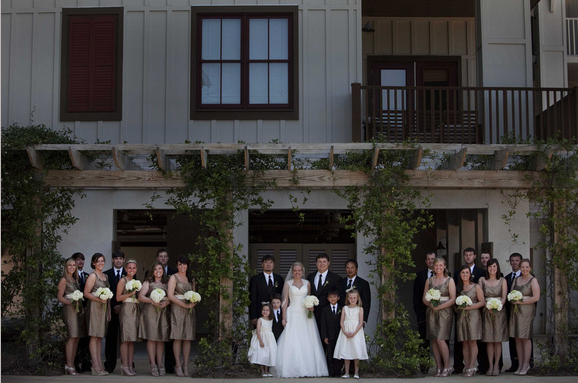 I first showed you guys a peak into my May Santa Rosa wedding here. While I had a few photos from my own camera, I've been waiting to incorporate some of the photographer's shots as well. Now that they are available, I can show you all of the gorgeous details! Let's start with Brynnan's bouquet. 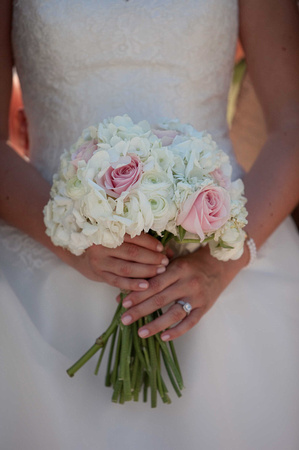 It consisted of white jumbo hydrangeas, white ranunculus and light pink roses wrapped up with jute twine. 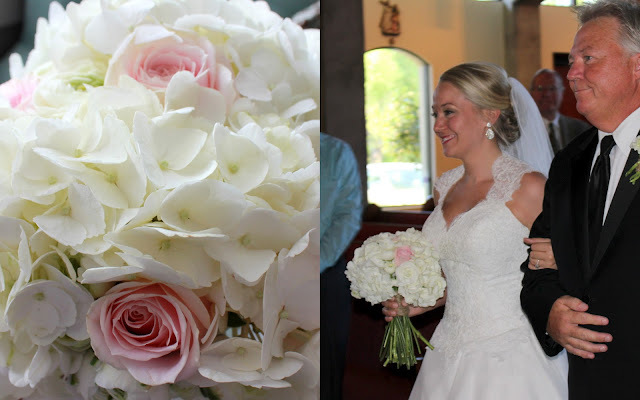 The end result was a ball of soft, sweet and romantic blooms fit for a bride. 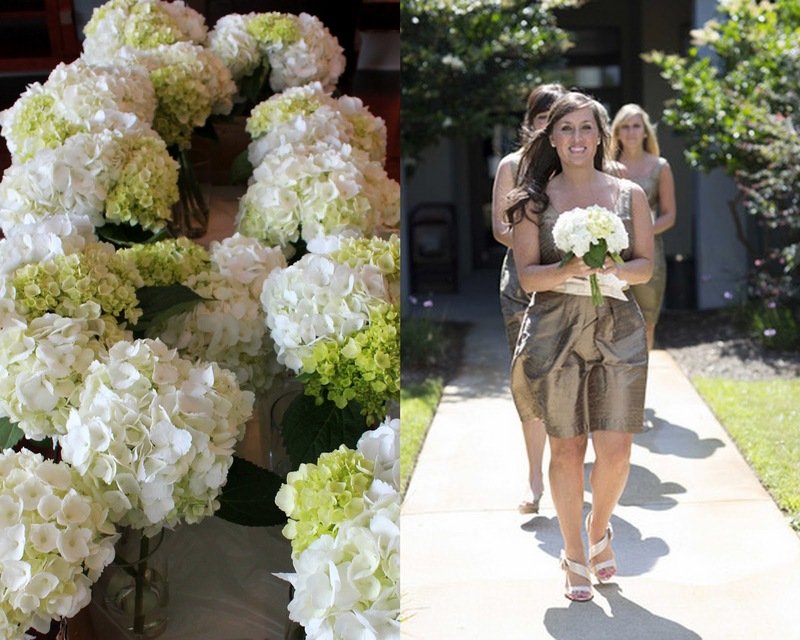 Her bridesmaids carried a mix of white and green hydrangeas also wrapped in jute. 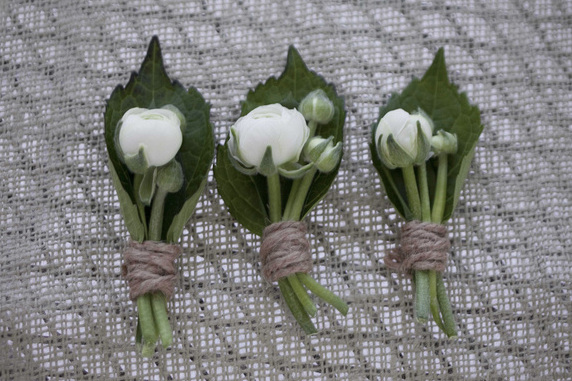 The boutonnieres were made of hydrangea leaves and white ranunculus. 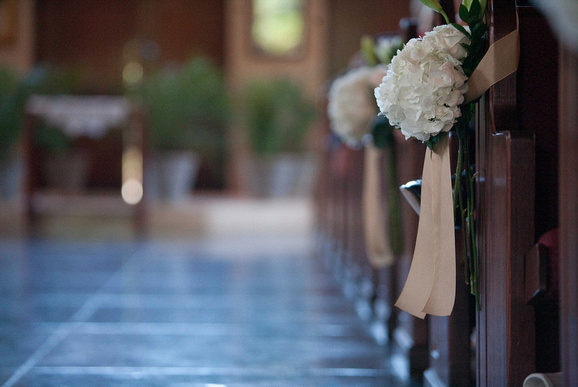 We kept the ceremony decor classic and understated so as not to compete with the beautiful architecture at St. Rita Catholic Church. 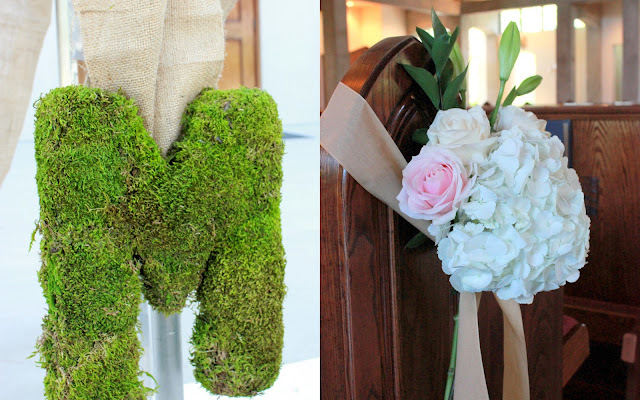 I created moss covered M's to hang from the rails outside the church and simple arrangements of hydrangeas, roses and greenery were tied to the pews with a linen ribbon. The majority of the floral work went into the reception site at Cabana Blue. 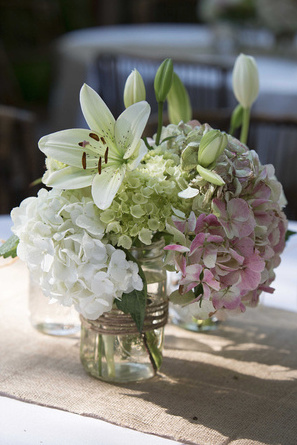 Multiple arrangements were placed on each table consisting of antique hydrangeas, green and white hydrangeas, tulips, roses and greenery. 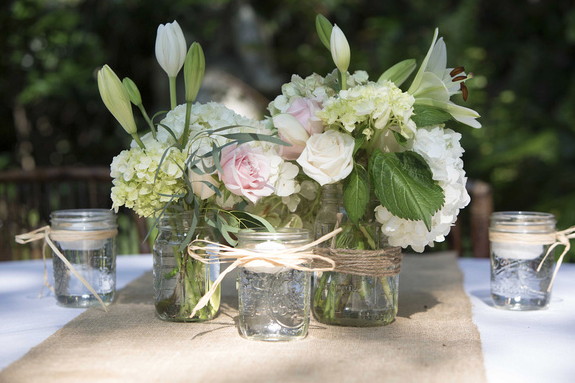 Mason jars were used in lieu of vases and several were even hung from the trees surrounding the back porch area. Twine wrapped jars holding floating candles were placed around the center arrangements, and the burlap table runners that I mentioned making here were the anchor for each table. Although the flowers were a huge part of the wedding, I can't write this post without showing you some of the other great details Brynnan incorporated into she and Michael's special day. The couple opted for a dessert bar instead of the traditional groom cake, and I have to say, it was a huge hit! The color coordinated cake pops, mini cheesecakes and pies were the talk of the night. 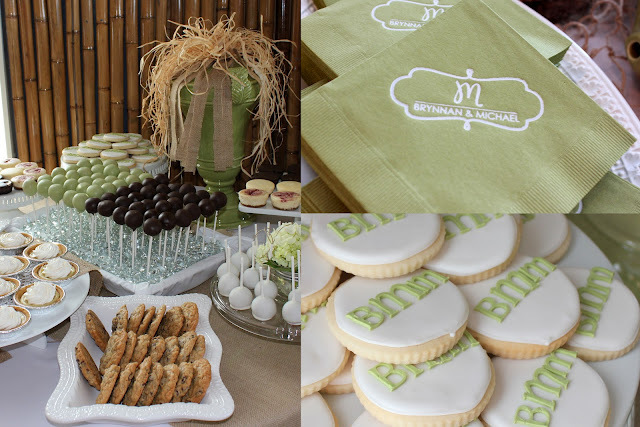 Pops of muted chartreuse were seen throughout the decor, from the custom napkins to the monogrammed sugar cookies. Their custom monogram was also carried over onto their cake design. Isn't it beautiful? The ruffle details and monocromatic scheme made it so uniquely elegant. As favors, Brynnan and Michael gave out koozies to be used by guests throughout the evenign. One side featured the same logo that appeared on their napkins and the other side had the date and location of their wedding. I've seen many koozies wedding designs in my time, and I thought this one was so chic. The logo was designed by Lily Pad Boutique Designs in Birmingham, AL. 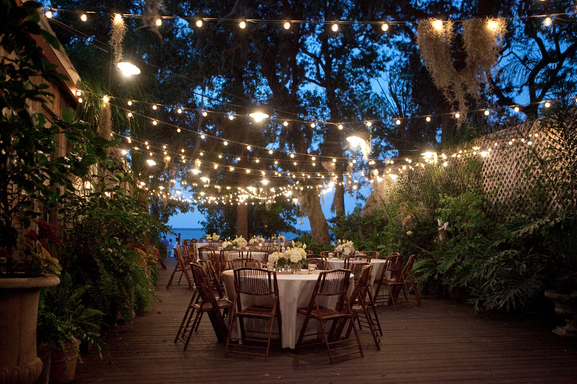 I'll finish this post off with a few shots of the back porch of Cabana Blue at night. To say it is something less than magical would be an absolute lie. 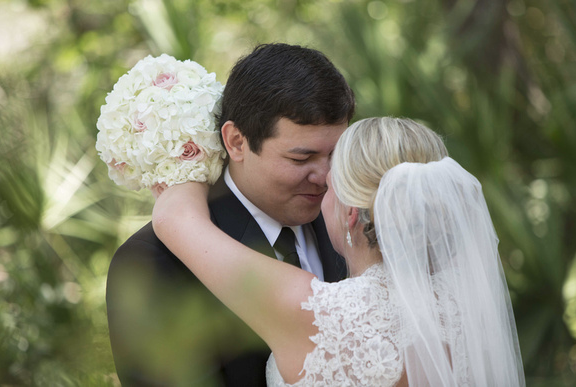 Congrats again to the happy couple! Thank you for letting me be a part of such a memorable day!